Besides using anti spam plugin akismet, another perfect way to defend your site from spammers is to create math challenge which is easy to do and no plugin required. Like the common anti spam or quiz this math challenge also gives interface that require active interaction of commenters (human). By providing this tool for your wordpress site, it will filter comments made by spambots because this math challenge preserve challenge that only human solvable. The other benefit is, this math challenge anti spam does not need plugin which is absolutely important to keep your blog performance runs smooth, stable and of course load faster. Here, we're going to hack your wordpress engine by adding a little php codes. It takes only two easy steps, add the code to wp-comment-post.php and comment.php. The code will shows math question interface like 2 + 1 = ?. So you may also put the code somewhere else in your theme. Untill then, the math question should work and appears on your site, it will appear with a question on your comment box. Copy the code below and put it right after it, you're done. The function of the second code is to verify the answer of math question created earlier. In case commenters forgot or gave the wrong answer, wordpress will block comments untill the math question correctly answered. 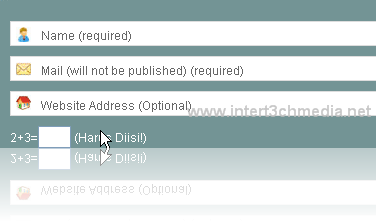 You may also change the error message with your own word, change this "Sorry, wrong answer. Please go back and try again! and replace it to your liking.